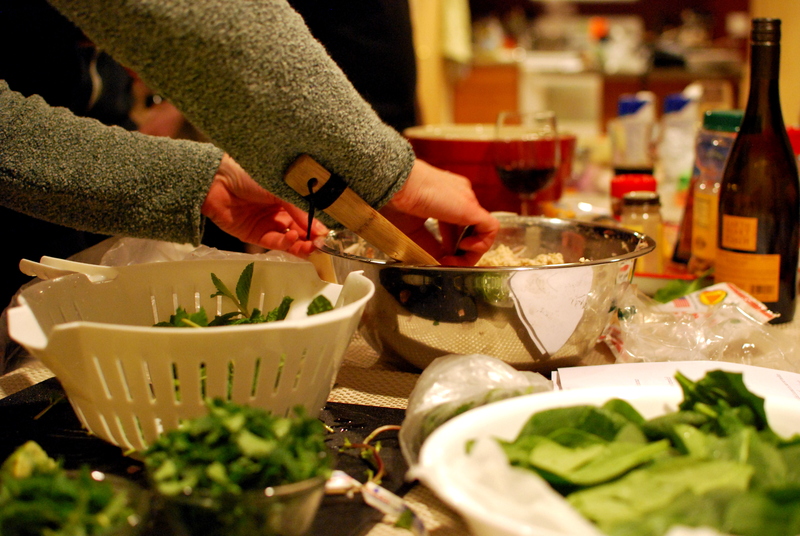 You are here: Home » Summer Thai Cooking Classes … are we crazy!? Summer Thai Cooking Classes … are we crazy!? 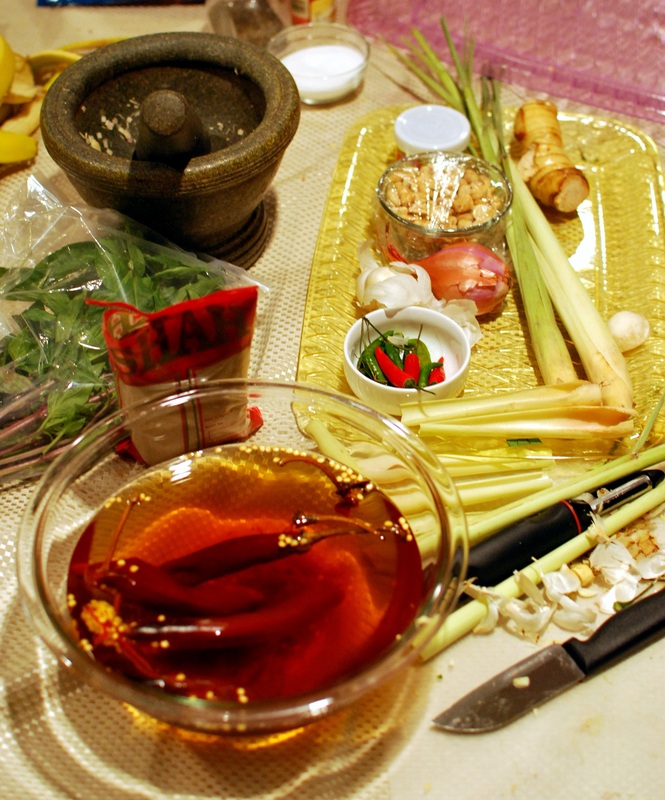 What is an American doing hosting Thai cooking classes anyway? You only spent ten months in Thailand. You don’t have any formal training. The voices go on in my head until I wake up in a cold sweat and question everything I’m doing! Okay, not really. I’m playing the drama card. But, don’t think those same thoughts didn’t run through my head when I decided a few months ago to hold my first Thai Cooking class. At that point, it was just a creative way to solve a funding problem. The dog rescue that I volunteer with was in need of medical funds and recently a few of my friends had mentioned wanting me to show them a Thai recipe or two sometime. In order to kill two birds with one stone I decided I’d hold a charity cooking class with all proceeds going straight to the rescue. *Note: If you’re a dog lover like me (specifically boxers), check out Northwest Boxer Rescue and see how you can help or get involved. One of the class participants mixing the laab gai. Note the wine. It wasn’t anything spectacular – a group of 10 dog lovers came together for a night of Thai cooking and some wine. Lots of wine. I had an opportunity to teach something I’m passionate about, they had a chance to learn, and a few dogs were helped in the process. It was a win, win, win! A few weeks later I decided to host another one. There were a few people who couldn’t make it to the first one that still really wanted to attend so we did it all over again. The first one had been my solo endeavor, but for this round Cory decided he wanted to be more involved. Gladly, please, and thank you! It’s tough instructing a bunch of adults! He helped me pick out the recipes, plan the order of events, instruct, and even clean up (gotta love the man). Our group was smaller this time, only six, but it worked out well. We made a few tweaks to the way we went about the class and everything seemed to work; everyone seemed to enjoy themselves. We have our third charity event scheduled for the end of this month, this time for Cory’s brother. He is attempting to complete all 16 Tough Mudder events in the UK and Ireland this year to benefit Hope for Heroes. Can’t wait to raise some money to donate to his cause. Getting ready to prepare the Panang curry paste. *Note: To learn more about Aaron’s challenge or to donate to his cause visit Aaron’s Tough Mudder Challenge. Anyway, I’m getting a bit off track. Somewhere in the midst of these charity classes and the planning, the execution, and the debriefing Cory and I had a thought. Why not do these more often? Everyone we invite over for Thai dinner parties asks us to teach them some of the recipes. We’ve received compliments on our food and how much better it tastes than many of the restaurants they visit (well it’s authentic, of course it’s better)! The participants we’ve had in our classes so far have all talked about how they’d love to come to them again. That’s where those questions of doubt come in though. We aren’t Thai. I only spent 10 months in Thailand and Cory only spent three weeks. Neither of us have any formal training. And I’ll repeat in case you weren’t clear … we’re not Thai. So what are two Americans doing hosting Thai cooking classes? Plain and simple, we’re having fun! We both have an incredible passion for this culture and this food. We work hard to learn and practice traditional cooking techniques. We study the ingredients, we try recipes again and again. We immerse ourselves in the culture as much as we can … even as Americans. Why not share this passion with those around us? If people are interested in learning then who is to say we can’t be the ones to teach them? Bottom line, we’re extremely excited about this summer. We are thrilled to take what we love and share it with family, friends, and hopefully new acquaintances. It’s one thing to explore a passion on our own; it’s another to share that love with others. If you are interested in learning a little bit about Thai culture, exploring the ingredients and dishes of Thailand, and getting some hands-on experience cooking delicious Thai food, then give our classes a try. We’d love to have you. Visit the Cooking Classes tab at the top to view our class schedule.